Effect of varying Ni/Mn ratio on the structural (martensitic) and magnetic phase transitions of parent as well as Si substituted Ni-Mn-In alloys has been investigated using X-ray diffraction and magnetometry techniques. A small increase in Ni/Mn ratio by a mere 1 at.% drives all the structural characteristic temperatures toward higher value but the magnetic Curie temperatures decrease due to this change. At low temperatures, the exchange bias which occurs due to the coexistence of antiferromagnetic and ferromagnetic phases, decreases as the Ni/Mn ratio is increased. A remarkable magnetic entropy change (ΔSM) is exhibited by these alloys at the first-order structural phase transition. 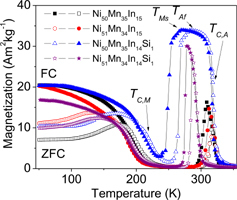 Ni substitution for Mn enhanced ΔSM and the highest ΔSM (= 19.9 Jkg-1K-1) was exhibited by Ni51Mn34In14Si1 alloy at 279 K for a magnetic field change of 0 – 1.2 T.